Wow. Check this out. 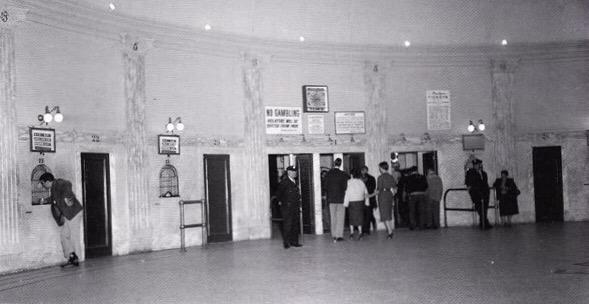 Here is a photograph of the rotunda within Ebbets Field in Brooklyn. For whatever reason, there are very few photos of this part of the ballpark. Pic via @MLBcathedrals on twitter. Via Ken Gurnick at MLB.com, "Mattingly ready to turn page on Pirates series." "We don't have time to feel sorry for ourselves," Don Mattingly said. "Nothing happened here in Pittsburgh that changes our mind about our club. Basically, we had a chance to win every game in the series. We're lucky, really, where we're at. Nothing changes my mind that we can play with anybody." Via Bill Shaikin at the LA Times, "Albert Pujols, Clayton Kershaw team up for charity." Go here to find out more and to participate. Via Mark Saxon at ESPN, "Don Mattingly meets with Yasiel Puig about playing time." “I just let him know that he’s not just going to automatically be out of there against righties. He’s going to be in there, it’s just occasional days off,” Mattingly said. “I know a couple have come here recently as we want to mix Carl back in. Via Scott Eden at ESPN, "Federal investigations into Cuban smuggling, Major League Baseball slow." But people with knowledge of the federal probes have told Outside the Lines that the MLB piece of the investigation has slowed, as federal agents have struggled to convince officials at the U.S. Attorneys Office in Miami that enough evidence exists to move forward. Via Steve Adams at MLB Trade Rumors, "Dodgers Release Chris Heisey." The Shorpy photo blog shares a fantastic family photo from early 1965, here. It features a couple of kids on top of a wooden bench playing with a toy. What makes this pic noteworthy is that the oldest kid is wearing a vintage Dodger t-shirt that must be from the 1963 Dodger season. Check it out here. Via Ken Gurnick at MLB.com, "(Brett) Anderson injures right wrist on checked swing." Anderson developed tendinitis in his right (non-throwing) wrist after a checked swing in an at-bat against Oakland's Sonny Gray on July 28. He is undergoing acupuncture and wearing a protective brace when not at the ballpark in an attempt to reduce the inflammation. "I wouldn't be Brett Anderson without having stuff nobody's seen," the self-deprecating lefty said. Check out a pic of some of those acupuncture needles in his arm via his instagram account, here. Shawn Anderson at the Hall of Very provides a brief update on a couple of former Dodger players: "Brian Wilson is Jacked" and "Andruw Jones Is Hoping For A Comeback."